We’ve heard from Joaquin Phoenix and Emma Stone in recent days, and now new interviews have run with the third star of Irrational Man, Parker Posey. Speaking in the lead up to the film’s UK release, she spoke about Allen and the making of the film with two UK publications. She told Dazed how she got the role. Allen’s casting director, Juliet Taylor, ended up on a film jury with Posey in Krakow, Poland, and the two got to know each other. “I guess it was just a case of sitting together and being at the right place at the right time… and the right temperature and the right age, the right look – you know, all that,” says Posey. Taylor invited her to meet Allen (“One minute you’re shaking his hand and making nun jokes, and then his foot is out the door!”) Soon after, she was asked to be in the film. And how it felt on set. Kinda cool, during the interview they bump into Sam Rockwell. Quite a coincidence, the pair appeared on the cover of Dazed in 1998. Even more so, that in that same year Rockwell appeared in a Woody Allen film – Celebrity. The photo we used is also taken from Dazed. The Independent also spoke to Posey, where she discussed how she felt to be part of ‘Irrational Man‘. You feel rescued. I felt like an awareness took hold of me… I feel like I’m a gambler. I have standards and kinds of work that I want to do that I always dreamed of doing, and the material is not there. You read 20 pages of a Woody Allen movie, and it’s a relief. It was a dream come true to work with him which is surreal. She also spoke about Phoenix’s character, and her’s. I’ve been attracted to these types of men and they’re compelling and fantastic. But you can’t save them, and Rita doesn’t want to save him. I like Rita because she’s in her own fantasy and I love that. She doesn’t even really see him. Emma’s character gets a little more lost in the maze, but Rita knows better. Rita is a mature woman. We love this rebirth of Parker Posey. She is also set to star in Woody Allen’s 2016 film, currently in production in LA. 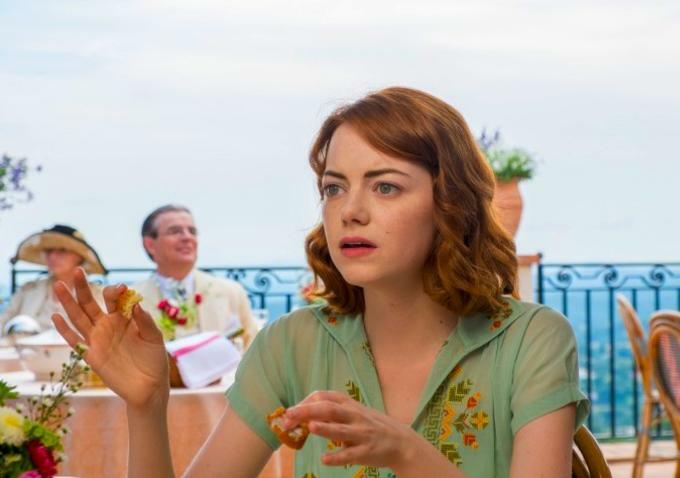 ‘Irrational Man‘ opens in the UK on 11th September.